Easier said than done in the first trimester when you feel utterly rubbish, and wow I didn't know so much vomit could come out of me! But we are past that now, and whilst I seemed to have escaped the promised second trimester energy burst, I feel our baby boy kick me every single day, getting stronger and bigger each week that passes. I've felt him a few times by putting my hand on my tummy too, but when his other mommy tries to feel him he seems to play games with her and stops! I can see my shape change to accommodate him, and marvel at my body's ability to nurture him and allow him to grow inside me. So it seems that I have reached the stage of loving every second of being pregnant, and never really wanting it to end, but at the same time being desperate to meet our wonderful little boy and wishing that could hurry up! 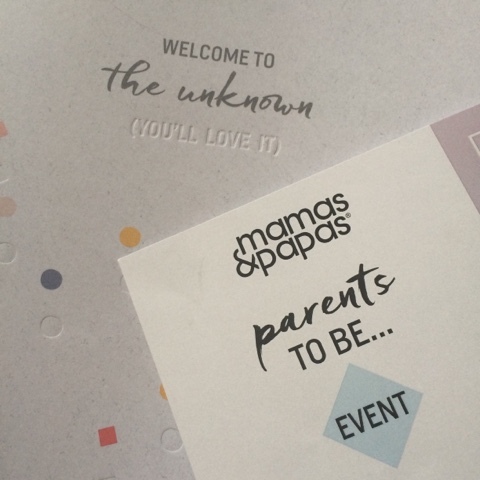 Last week we went along to Mama's & Papa's Parents To Be event. 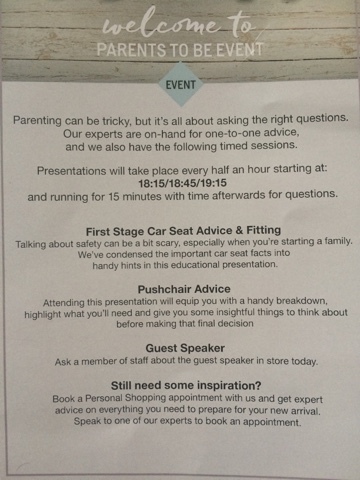 We were given information on the event by a member of staff in store as we were shopping, and asking her advice on fitting a car seat! The event was described as the perfect way to see products such as prams and car seats fully explained and demonstrated, and the opportunity to ask as many questions as required - including the little ones you may not necessarily feel are big enough to make an effort to go into store and ask. The event is held in store after store closing, and we were super excited to attend and be able to ask as many questions on all things baby! Upon entering the store, we were greeted with bottles of water, snacks, a goody bag, and information about the event. There were four presentations - car seats, pushchairs, and guest speakers on nutrition and baby first aid, which each repeated three times an hour. We found there were around 10 people at each presentation we stopped at - the events are limited to around 60 places so are well organised to not become too busy. We did find it easy to chat to staff after the presentations to ask more in depth questions too. 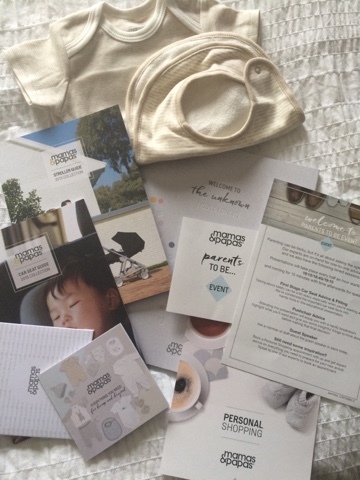 We have to admit - our first plan of action was to look at all the adorable clothes, toys, and nursery decor! We then got down to business and visited our first presentation; we chose the one area we are both a little worried about getting right - car seats. Despite already having purchased our car seat from Mama's & Papa's, we were pretty clueless on safety, fitting, and how the seat works in general. The presentation was quick and informative, and actually took a lot of our fears away - it appears car seats aren't these awfully complicated things that we had feared, they are actually very simple to get right, phew. We asked lots of questions after the presentation and the lovely staff member was happy to give us one to one demonstrations. We walked away saying "OK even we can manage that", so maybe it won't be so bad! We then attended the presentation on pushchairs, which was again really helpful particularly as we have yet to choose ours. Buggies / pushchairs / prams / travel systems again seem so awfully complicated, with so many different brands and options that we were wondering where on earth we should start, but as the presentation told us, there are a few important points to consider - size of car, how often it'll be used, type of places you'll be walking (town centre or park etc), where you'll store it, and then once you know the answer to that then your options become much clearer. It gave us a great starting point, and we definitly have a few favourite in mind! We decided not to visit the nutrition presentation as it seemed very formula feed focused, as the woman was sat in front of a demonstration 'perfect prep machine' by tommee tippee; and we have already decided our little man will be breastfed - as Lauren is a midwife we don't need much advice with that! Finally, we also gave the first aid talk a miss as we didn't want to overload ourselves with info after the other two talks, especially on something like first aid, which we feel needs some time set aside to itself! We really enjoyed the event - it was fun, helpful, and the staff were fantastic - so approachable and knowledgeable (and thumbs up for automatically assuming we were a couple and treating us as such!). We would highly recommend it for mums and dads to be, and may pop along to another one before our little boy arrives! This week I also started pregnancy yoga classes. They are something I always knew I would want to take part in, having looked after many women who have used the techniques learnt in pregnancy to help them through labour, plus the idea sounded wonderfully relaxing. The classes near us are very popular and get booked up quite far in advance, so although I didn't want to start until around this gestation, I booked my place when I was about 12 weeks pregnant. It seemed so far away at the time but has rolled around surprisingly quickly (same goes for the whole pregnancy!). I have to say I was incredibly nervous beforehand, as I had no idea what to expect, what the other women there would be like (I was dreading walking in to a room of tall skinny yoga waifs who were all experts in these really complicated moves), and even worried about what I should wear! But I couldn't have been more wrong. It was evident that some of the class of 7 were pretty practised in yoga, but others were like me and trying it for the first time since getting pregnant, but I surprised myself by being able to follow everything the leader was doing, and found myself really, really enjoying it. The stretching and breathing exercises were all related back to the physiology of pregnancy and childbirth, and reminded us of the importance of things like leaning forward and hip swaying to encourage baby in to a good position. Whilst I live and breathe this in my work, it was lovely to not be a midwife for a night, and just enjoy being a woman preparing for the birth of her baby. I have to say, the practise contractions we did were pretty hilarious, being on all fours and breathing really deeply, but I hope that the practise now will help it to become second nature when the time comes for baby to exit my womb! I shall certainly be looking forward to going back each week, although I do feel it's a shame that Sarah can't come with me as I think partners would really benefit from the class each week too, along with the relaxation that it brings. Although there is a monthly couples class that runs through everything over three hours or so and give you tips to take away to work on together to get through labour, and we shall definitely be attending that a little nearer the time. So there we have it, we are now in to the realms of planning things like what we want his nursery to look like (his Mommy S has it pretty sussed), what his middle name is going to be (having decided on a first name around eight years ago, we go round and round in circles with middle names! ), and beginning to plan when we might take our parental leave. Years and years of dreaming and planning have led us to this point, and I just keep looking down at my ever growing tummy and thinking "I just can't believe this is happening to us!" 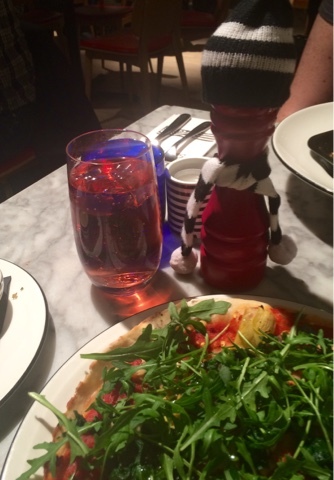 We aim to savour every moment - we think the rest of this pregnancy will go by in a flash! Can't believe it's 22 weeks... Time is flying by. Can't wait to meet the little man. 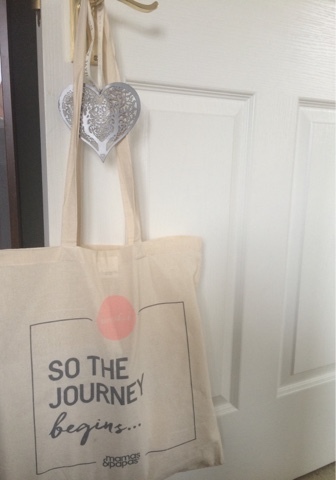 The event sounded really good & the goodie bag is super cute. Yoga is something I've never understood before but reading what you have above I suppose it is useful to pregnant mothers... Hope it works out for you.